In Nepal I found several fair-trade organizations, and I asked what is fair trade. I wanted to work with them. There response was we work directly with the artisans, we pay them directly. The artisans work out of their house, instead of in a factory and this is a great service for people who are not able to visit Nepal regularly. But since I do visit Nepal a couple times a year and I pay the artisans myself, it did not make sense to add another layer. By paying the artisans directly, the artisans are making more than they would if they worked in a ‘factory’, but the pay is still very minimal. 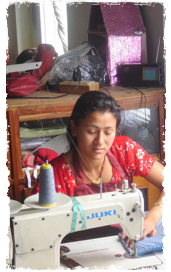 The amount that someone in Nepal makes varies greatly depending on the type of work they do. A very skilled tailor will make about $12 to $14 a day, maybe a little more. This comes to a little less than $2 an hour. An average tailor, which is the vast majority, will make about $6 to $8 a day which is about $1 an hour. There several other folks that do basic hand stitching and trimming and they make even less, as little as $3 or $4 a day. This is the reality, and it is incredibly frustrating. But many people are just glad to make anything. 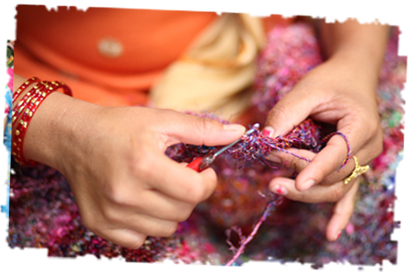 In light of this difficult economic situation, our policy at Earth Divas is to pay out all of our profits to the Earth Divas artisans.